Earning money online is one of the most searched query by Google user. So that means most of people are interested to know how they can make money from home. Everybody want to know techniques about “How to earn from home”. It is no doubt that internet has huge potential for money makers. There are millions and billions of money floating on internet, only you have to know the technique to grab it in your hand. There are so many techniques out of which most popular technique is Google AdSense. Google AdSense is best online way to convert your any talent to money. Only you have to know how to expose your talent online. 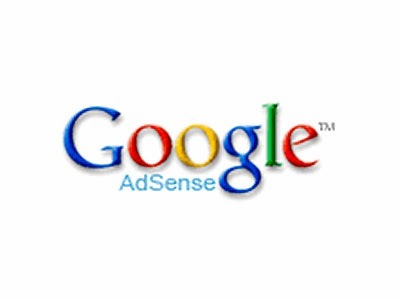 Google AdSense is product which run by Google. It allow publisher to serve advertisement on their content site in form of text link, image link, video and many other forms of interactive media advertisement. These ads are mean to target the audience specific to the site content. If you owning a site or blog than you can show ads on it with help of Google AdSense program. Google AdSense program generate so much revenue from these ads and pay some part of it to the site owner or content owner. As per Wikipedia in 2013 Google earned 28% of its total revenue via AdSense. So it’s no doubt Google is much more serious about this product and they will not show a little bit mercy to you if you violet any of Google AdSense policy. Any little bit of policy violation and your site will be ban from AdSense or your AdSense account will be suspended. So always play fare from your side. 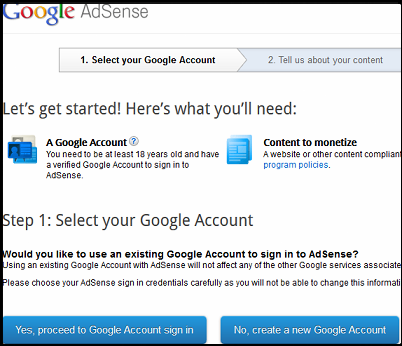 How to get AdSense account and earn from AdSense? What should you already have to get an AdSense account and start earning? A verified Google account. You also need to be 18 year old to have Goggle AdSense account. A site with unique content on it and at least 6 month old. According to new Google term and condition your site must be 6 month old to get a new AdSense account. A postal address where Google will mail you your AdSense payment checks. Before sending check Google will verify your postal address by sending a PIN there. You need to verify your postal address by entering that PIN on your AdSense page. First is by having a Blog and apply for AdSense. Second method is fast and easy way to get and AdSense account, which is via your YouTube channel. 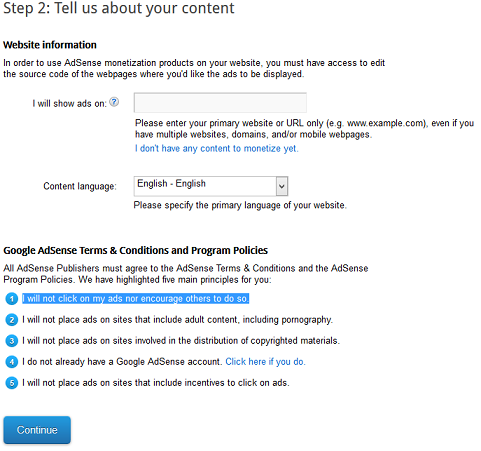 But you need to get separate approval for you site content if you want to show AdSense ads on your content site. Go to Signup page of Google AdSense and Signup with your account. You will get page like shown below. Proceed with Yes if you already have Google verified account and Proceed with No and create a Google account if you don’t have one. Just keep in mind you need to verify your account via mobile and you need to be 18 year old so fill your details by keeping above in mind. Don’t provide and wrong details while creating Google account. Correct information’s like mobile numbers and Address will help you getting faster approval for AdSense. After you done with first step you need to mention your website URL on second step. This will be website which will be verified by Google before approving your Google AdSense account. So only mention website which is completely qualifying Google AdSense policy and guidelines. Also only mention website which is own by you or you have rights to modify source code of website. Don’t think of providing some other famous website link and get AdSense faster, that idea don’t going to work and in result you might get permanent AdSense disapproval for your Google account. 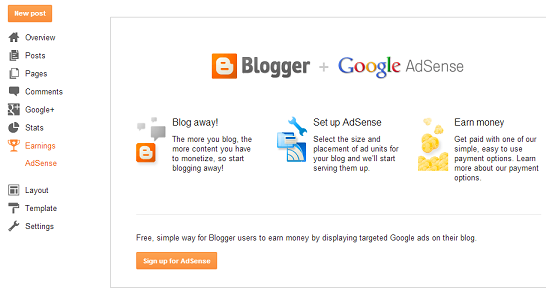 If you have BlogSpot blog than you can apply for AdSense directly from your blogger dashboard. Just click on AdSense option on Earning tab and you can easily see “Signup for AdSense” button there. Note that this button will be only enable when your blog is already qualified for AdSense. If you get this button enable Just click on button and follow the instructions next. After successfully completion of above two steps you will be get page on final step where you will be asked to fill your detail like contact information’s like your country name and address. You need to careful about these details because only address which you can edit later rest are non-editable. After filling all details click on Submit my application button and wait for approval. Once your AdSense account is approved than you will able to login to your AdSense dashboard and from there you can select ads and get your ad code and display it on your website. After you create your YouTube channel and upload some video there, you can earn good money by from traffic of your video. 2. After this you need to accept term and conditions and simply click on few next buttons. If you don’t have any YouTube channel than you will be ask to create one on YouTube. Create it if you don’t have it. Just follow instructions and provide your details for your channels like your name and date of birth. 3. 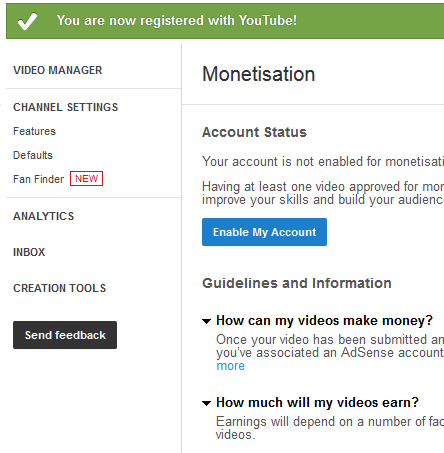 After finishing with your YouTube channel you need to finally apply for AdSense. Keep in mind that you still can apply for AdSense for your YouTube channel without having any video and views but there is more chance of rejection so it’s better not to do it before you upload some videos on it. 4. First upload some videos and share it on social media site and get some good views and share. Normally 5 to 10 videos will be enough and around 500 views will be ok to apply for AdSense (There is no limit but this figure is secure , some time you will get approval with one video and 100+ views so better be in secure zone before apply for AdSense). 5.Google will not allow monetization for videos which are copy righted or for which somebody else have rights. Even if your video is real and created by you but it have background music from some copy righted source than you will be not get approval. So I will suggest you to be alert on above issue and only upload your videos which are qualifying Google policy. After this you will be encounter with same AdSense forms for registration as mentioned in previous method. Fill all details as mentioned in above step and you will be redirected back to YouTube after you are done. 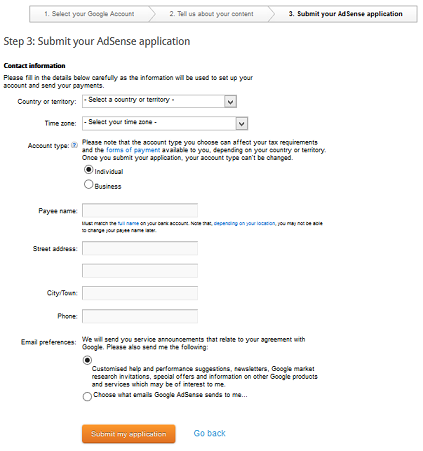 Once you are done with this you will get mail from Google AdSense team about your account approval. So finally you come to know how to get your AdSense account approved and earn from your website/blog or YouTube videos for free. Don’t even try to neglect the AdSense terms and conditions after you got approved. Because Google will never allow this and your account will surely banned. Once you get approval for your AdSense account than you will get access to your AdSense dash board and you can create your first AdSense ad unit for your website. Go to This Link which will help you to create your first ad unit for AdSense.